A poster on LinkedIn brought a very interesting piece of information to my attention. He said that the word “No” is one of the first 10 words that a baby will learn in their lifetime, whilst the word “Yes” doesn’t make it into the top 20. I have not researched this myself, but it sounds quite accurate to me, so for the sake of this article, I will assume it as fact. Facts are a very interesting thing. By definition they are not debatable. However, that does not mean that facts can not cause a debate. Two people can take the same factual information and come to very different conclusions. The poster who alerted me to this fact used it to suggest that saying “no” is easier than saying “yes”. It is easier to avoid responsibility (i.e. saying “no”) than it is to take responsibility. He suggested that we need to become a “Yes Man”, someone who is willing to commit, willing to step up and take responsibility, willing to become a leader. He later suggests that we tell our children “no” far too often. Suggesting that perhaps we need to do a better job communicating with our children, trying to find ways to say the same thing, without using the word “no”. I also saw others who work in the mental health field who voice a similar view. Example: Child wants to color, but the parent wants the child to be in pajamas. The parent has said the same exact thing, without using the overused word “no”. The second point I would like to make isn’t about what we say to others, rather, it is what we say to ourselves. 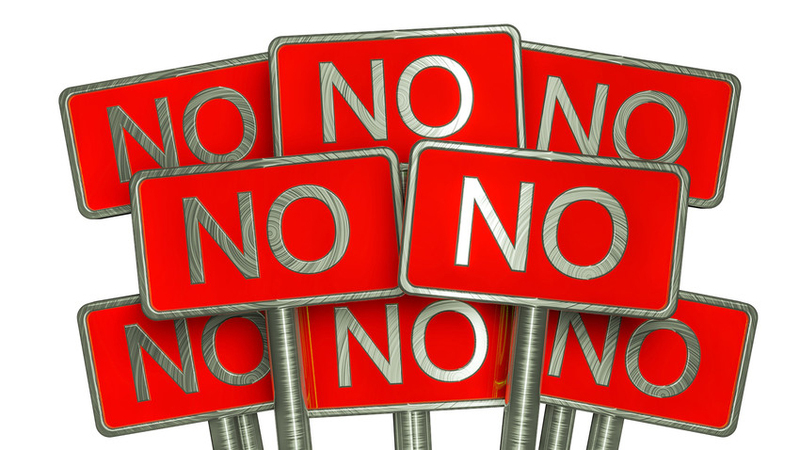 We are all a product of our upbringing, and that includes a product of being told “no” very often. People process “no” as a negative. Are we negative to ourselves simply because of all the negatives we have amassed over the years? Do we view ourselves as lesser simply because we took the nos of our younger years and nurtured them with more negativity? Granted many of the nos of our younger years were needed and deserving, but that doesn’t mean we need to allow it and the negativity that it yielded to remain a core part of our thoughts about ourselves. At this point, some of you might be wondering why I chose to begin with a quote that seems to be the antithesis of the direction of this article. The answer is quite simple, because there is a time for a no and there is a time for a yes. There are times when no is the easier word to say and there are times when yes is the easier word to say. There are times when the no needs to be delivered softly, or in an indirect way, and there are times when it should be a very blunt “NO”. The wisdom comes from knowing which rule applies when. For this reason, I am personally turned off by the very many “gurus” who preach absolutes. This yes and no discussion had the very real possibility of being interpreted as an absolute. I did not want my readers to think that I was preaching an absolute. Absolutes can be extremely dangerous. Sometimes the person who is the exception hears it, without knowing that they are the exception. No one ever succeeds without taking risks - Can the person properly calculate the nature of the risk? Will they blindly take risks simply because they feel the need to be risky? Opening a restaurant without a proper license and without a chef is risky. Does the listener believe that this is the type of risk they need to take in order to succeed, or do they realize that this reward isn't worth the potential risk involved? Never Give Up - Sometimes the better advice is to cut one’s losses and move on. The investors who gave up on Enron or Circuit City after losing 50% percent of their investment did better than those investors who “never gave up”. One needs to be extremely careful when using absolutes, as one can never be certain that the message that they are trying to convey is indeed the message that is being heard. Additionally, the listener might very well hear the message as intended, yet they might later apply it incorrectly.